Genevieve: When The Incredibles hit theaters in 2004, the cinematic superhero wave was just starting to crest: Sam Raimi’s two Spider-Man films and Bryan Singer’s X-Men movies had primed the pump for the oncoming mega-success of the Marvel Cinematic Universe (which really kicked into high gear with 2008’s Iron Man) and Christopher Nolan’s Batman films. Since then, original superhero films—that is, films not based in an existing comics or television property—have all but gone extinct, or at least retreated to the fringes. (See: Chronicle, Super.) So while The Incredibles was remarkable in its time, it’s even more remarkable now as a vision of what the superhero genre might have become if the industry weren’t so tied to the strategy of adapting established properties. This was the first time I’ve seen the movie since 2006, and while I loved it then, viewing it this time from the context of pop culture’s current superhero glut, I was doubly impressed. The Incredibles is one of the best superhero movies, full-stop. It’s also probably the best example of a far rarer, trickier beast: the animated superhero movie. (Tricky because it’s even harder for a superhero movie to shake the stigma of being merely “kids stuff” when it’s animated.) And the only film that comes close to rivaling it in this regard is The Iron Giant, the other practically perfect superhero homage from Incredibles director Brad Bird. But just because The Incredibles is an original story with original characters doesn’t mean Bird pulled them out of thin air: Both this movie and The Iron Giant wear their influences on their sleeves. Iron Giant is a top-to-bottom Superman homage, while Incredibles cherry-picks elements of The Fantastic Four, The Avengers, Watchmen, and more, and ties them all to an extremely Pixar-friendly tale of family and being true to yourself. Rather than the current superhero-film model—pick popular characters and build a story around their established mythology—The Incredibles uses superhero mythology as a loose inspiration for an original story based in timeless, sturdy themes, then adds specific superhero elements as the story warrants. Keith, you’re our resident comics expert, so I’m interested to hear how you think The Incredibles works as superhero homage, as well as how it’s held up in the decade since its release. Keith: “Expert” might be stretching it, particularly given some of the people you and I know, but it doesn’t take an expert to see how well The Incredibles works as an homage to superheroes in general, and The Fantastic Four in particular, with the idea of superteam-as-family. Most of the characters have powers that correspond to members of the Fantastic Four—the exception being the speedy Dash—and the personalities of the superpowered couple match up nicely to the FF’s Mr. Fantastic and the Invisible Woman (Reed Richards and Sue Storm, respectively). Smart FF writers have used the team dynamic to explore family issues. The Invisible Woman emerged as a stronger character, and changed her name from Invisible Girl during John Byrne’s 1980s tenure. And Jonathan Hickman and Matt Fraction’s more recent runs on the comic have spent a lot of time on how Reed and Sue juggle their world-saving responsibilities with the obligations of parenthood. It’s possible that those last two writers owe a debt to The Incredibles, which makes the tension between familial and professional (and by extension, civil) obligations a central theme. I can’t think of another superhero movie that portrays the personal tension of superherodom—or makes that tension into as strong a metaphor—as The Incredibles. Being Spider-Man weighs on Peter Parker, and Tony Stark talks about packing it all in (and sort of does) in Iron Man 3, but the tension usually seems more scripted than felt. 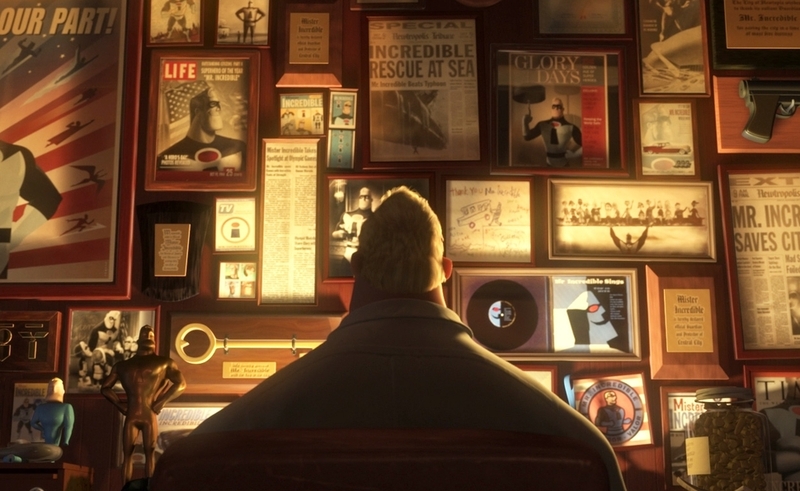 Part of what makes The Incredibles so effective is the way it portrays the toll not being Mr. Incredible takes on Bob. He unwillingly retires as a superhero under pressure from the public and the government. He’s prepared to find a balance between his superhero career and his family life, but retirement turns him into a broken, blobby man. He’s unhappy in his work, and unable to be fully present at home. Having his life thrown out of balance professionally makes it hard for him to be a great husband and father. Yet is risking his life to save the world worth it, if that decision means leaving a widow and orphans behind? Bird brings a light touch to The Incredibles, but he doesn’t shy away from heavy issues, heavier than most of the superhero films that have followed have dared to take on. That isn’t an obligation. I don’t really need to see Thor fretting about whether he’ll be able to make the mortgage if he doesn’t ditch The Avengers for a more stable career. But it’s to Bird’s credit that he squeezes that sort of material into the movie. Which is a long way of saying I love this movie, and think it’s held up brilliantly. Ten years on, and a decade deeper into a seemingly endless cycle of superhero films, do you see The Incredibles as a one-off, or a model others can follow? Genevieve: Well, it’s not a one-off in the sense that it will reportedly have a belated sequel sometime in the hopefully not-too-distant future. And this weekend’s upcoming release of Disney’s Big Hero 6, which takes some lessons from The Incredibles, proves it’s a model others have drawn from. But I still think, despite everything we’ve talked about here, most viewers probably think of The Incredibles as a Pixar Movie first and a Superhero Movie second (and a Craig T. Nelson Movie a distant third). Pixar movies tend to stand apart from other mainstream movies in consumers’ eyes. Although they span an array of genres, styles, and subject matters, Pixar’s brand is generally perceived as a distinct, distinctive quantity that can’t really be translated to a non-Pixar property. Whether that’s true is certainly up for debate, especially in recent years, but it certainly feels like The Incredibles is a superhero movie as only Pixar could make it. And its status as the company’s only true superhero movie (sorry, Wall-E, you’ll always be my hero!) makes it a one-off in that regard at least. One of The Incredibles’ most distinctive aspects—the thing that makes it unique within both the Pixar brand and the superhero-movie canon—is its visual style, which is retro, futuristic, and timeless all at once. While the film’s prologue is strongly tied to the 1950s specifically, the meat of the action takes place in an unspecified time period. Based on the length of Bob and Helen’s marriage and their kids’ age, we could infer that The Incredibles takes place in the 1970s, but nothing in the film’s visual style really bears that out. It’s mid-century modern all the way, with a healthy dash of retro-futurism. It’s a fabulous look, dahling—sorry, channeled Edna Mode there for a minute—and one of my favorite little delights in a film that isn’t short on them. Is there anything like that, visual- or story-wise, that stands out to you? Keith: The Incredibles is set in a wonderful era that gathers the best mid-century design had to offer with all of the tacky elements happily forgotten. The film’s world is precise without feeling fussed-over. It’s a world with room for robot invasions and such, but also one that looks like the characters could actually live there. (I kind of want to live there.) It’s a brilliant creation, even before the film populates it with such wonderful characters. It’s also one designed specifically for those characters’ adventures. This time around, I was struck by the brilliance of that long setpiece where Elastigirl infiltrates Syndrome’s compound and tries to keep her presence concealed while dealing with doors that close around and trap her flexible body. Bird has a gift for action scenes. Looking at this movie again, I realized it should have come as no surprise that he made such a successful transition to live-action with his brilliantly staged Mission: Impossible—Ghost Protocol. But he really outdoes himself in that scene, which keeps escalating and growing more tense as Syndrome’s goons file in and Elastigirl has an increasingly hard time keeping her presence concealed. We’ve talked about how this movie uses action and how it uses emotion, but it’s the combination that really makes it work. When Elastigirl tells her kids about how the bad guys they face now won’t exercise restraint, and will kill children, it establishes stakes for the rest of the film. But even before that, there’s that heart-in-throat scene where Violet has to create a shield around the plane in order to save everyone’s lives—and then can’t. It’s a movie ostensibly for kids with a greater sense of danger than similar films ostensibly for adults. (Though that might not be a useful distinction when we’re talking about Pixar movies and Marvel movies, all of which seem to be targeted at everyone of all ages everywhere.) What about you, Genevieve? Did you find it as gripping as it was charming this time around? Genevieve: I’m glad you called out that scene of Elastigirl taking down the guards through a series of sliding doors. I’d completely forgotten about it in the years since I’d last seen the film, and was struck by how well-choreographed it was this time around. There are a lot more great action-oriented scenes like that in the film’s back half—I admit to laughing aloud and clapping when the Parr family finally “assembles” into their crime-fighting poses for the first time—but what really struck me about The Incredibles this time out was how daringly bleak it is at the outset, before it gets to all the whiz-bang team-up action. After the delightful prologue that introduces Mr. Incredible and Elastigirl on the day of their alter egos’ wedding, Bird’s script spends a fairly lengthy bit of time establishing how drab and crushing life has become for Bob Parr in the years since superheroes were forced into hiding by a wave of public backlash and lawsuits. From the greyed-out color palette to Bob’s slumped posture and hilariously cramped car, everything about these opening scenes conveys tedium, detachment, and dissatisfaction—and the fact that it bleeds over into his family life, which looks wonderful in every other respect, makes things especially dark. It’s pretty bold to front-load a kid-friendly film with that much adult misery, but it’s essential to justify why Bob goes off the reservation. Looked at pragmatically, Bob’s choice to desert his family and go off on life-threatening missions at the behest of a slinky, mysterious woman (Elizabeth Pena, RIP) is fairly appalling, and Helen is rightly incensed. (I like how the scenes of Helen figuring out what Bob’s been up to allude to adultery without making the comparison explicit.) But as we see in the earlier scene where wage-slave Bob furtively whispers instructions to a sweet old lady on how to navigate the labyrinthine bureaucracy of the insurance company where he works, Bob just can’t turn off his inner hero, no matter how much the world beats him down. It posits his actions as a choice between being true to himself and his moral code, and being there for his family, which is a hell of choice for a hero to have to make. Family and vigilante justice is not a natural, easy combination, and The Incredibles does the hard work of giving its characters motivations beyond a simple black-and-white code of ethics. Keith, I believe this is the first time you’ve seen The Incredibles since becoming a father, so I wonder if Bob and Helen’s actions struck you any differently on this viewing? Keith: Little bit, yeah. Little bit. The irresponsibility of Bob going off and doing his own thing, no matter how noble, had a weight I’d never noticed before. Maybe it’s my own neuroses talking, but I can’t get on a plane, or sometimes in a car, without thinking of what would happen to my family if I didn’t make it back. Fighting robots? Forget it. But there’s another sort of tension it addresses, too. I think of Bob, as we first see him after the “15 Years Later” transition, as being in much the same spot as Homer Simpson at the end of “And Maggie Makes Three,” the flashback episode that shows how he was this close to getting away from the nuclear power plant, only to get trapped in the job due to economic necessity. But he’s doing what he has to do to protect his family, even if it’s started to turn him into a dead-inside blob of a man. Stakes get higher as you get older and pick up responsibilities, no matter how much joy comes with those responsibilities. The moments you get to pursue your own interests, the ones that don’t line up with the interests of your family and professional lives, get fewer and further between. It’s easy to feel like you’re becoming a different person than the one you thought you were, say, 15 years ago. The Incredibles isn’t the only movie that deals with that feeling, but it’s one of the best. And it’s one of the most hopeful, too. Maybe you become a different person and a better person at the same time. Families can do that, whether they have superpowers or not. 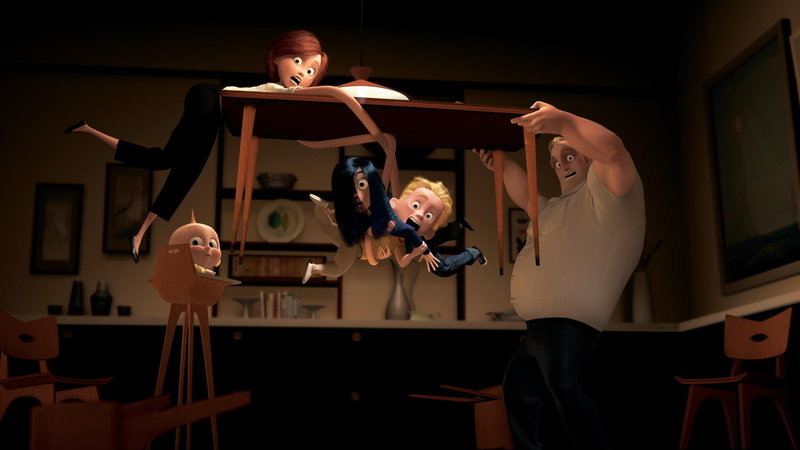 Our Incredibles Keynote digs deeper into The Incredibles’ careful balance between family drama and action movie, and the film’s place in the animation canon. And tune in Thursday for an essay looking at the foofaraw over the film’s most controversial line, and people’s driving need to map political messages over superhero stories.